One of those souvenir items of Baguio that made it famous in the past, the "iconic" barrel man of Baguio, wood carvings of a man hiding inside a barrel, with a spring contraption that pops up a phallic symbol whenever the barrel is removed to display the naked man's "masculinity." Some call it a nice souvenir, some call it art, a few tag it as disgusting, but Tutubi just say it's funny, even for first-timers clueless of what's hidden inside the barrel. 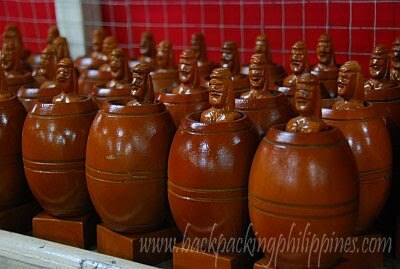 Where to buy the Baguio barrel man woodcarving? They're practically everywhere in Baguio City's souvenir shops, wood carving/handicrafts stores, and pasalubong centers. How much? Price depends on the size as usual. In Manila, Tutubi used to find them at Balikbayan handicrafts in Quiapos Ille de Tulle (Ilalim ng tulay) near Quinta Market and some other Filipino cultural stores (probably SM Kultura but not sure). I gave one to a white neighbor, when I got back here in the US, as a present. She cracked up when she lifted the barrel. Of course, I don't give it to just anybody; I have to be selective of who I give it to. I've always wanted one of those to display in the house. Who can get me one? mari, it depends on who you give it to...some conservatives will deride it but most people will have fun with it. luna, i used to have one too but had it broken a long time ago. Haha, revealing masculinity, that is just about universal. Here they used to have a monk that revealed all when you pressed his head. Slightly touchy just lately, seeing that the roman catholic bishop of our province had to resign last week after a revelation that he had raped his underaged nephew repeatedly. i remembered the first time i went to baguio and i was unaware of this. i got shocked! i was just a high school student then. unforgettable.